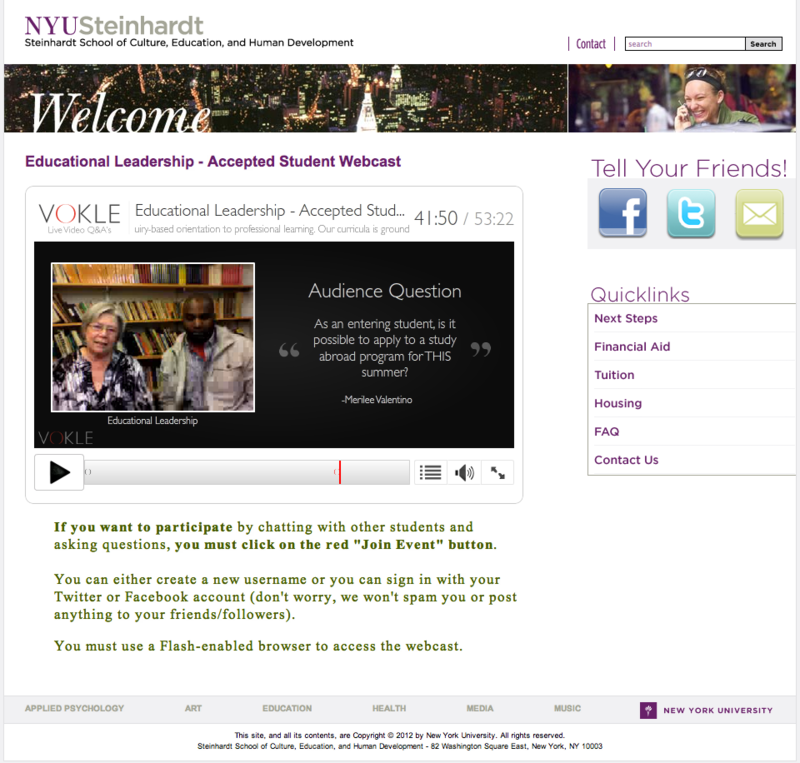 The “Yield” phase of higher education marketing is one of the most important stages of communication with prospective students. 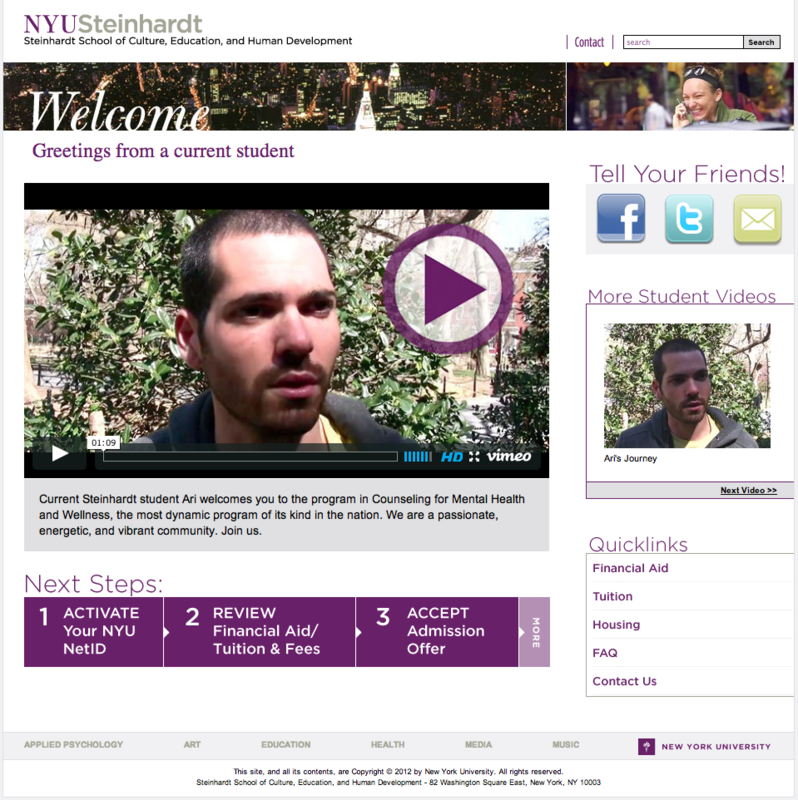 This is when you are trying to get all of the students that you have accepted for admission to make their deposit and confirm their enrollment. 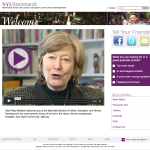 For certain academics programs at NYU Steinhardt, yield had become a serious problem. 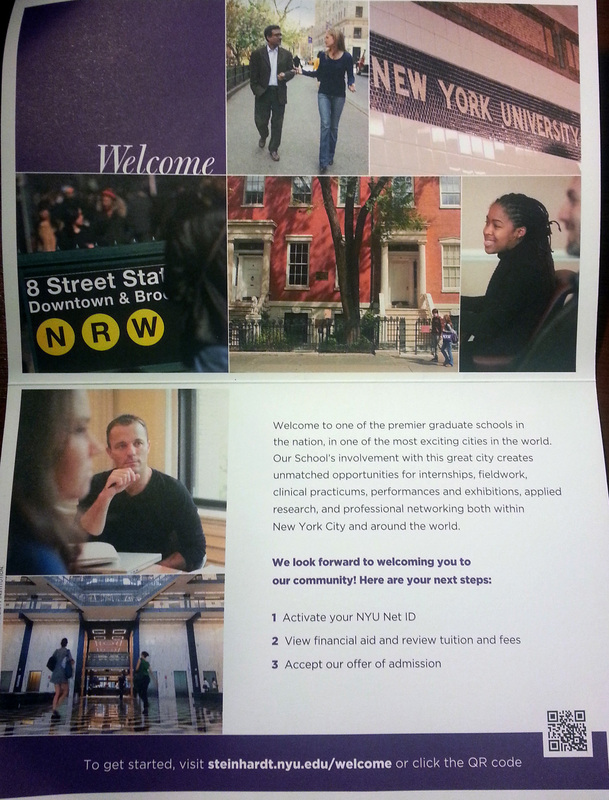 They were having no trouble getting high-quality applicants. 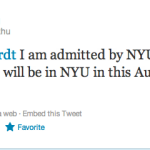 Many top-tier students decided to apply to NYU, but when push came to shove they weren’t choosing to enroll at NYU. 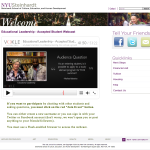 Check out my post about the Yield Campaign Flowchart on my blog. 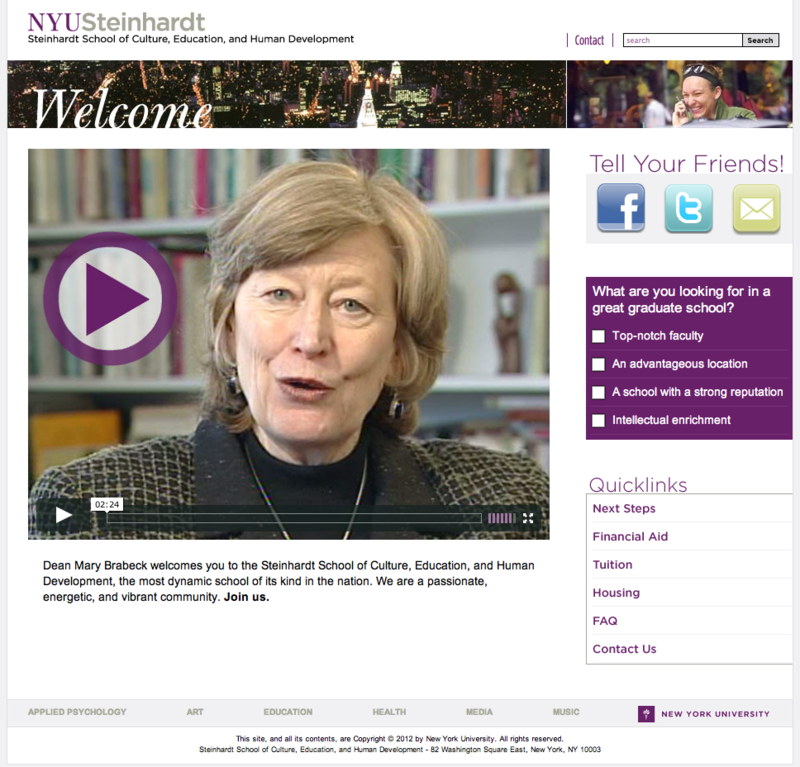 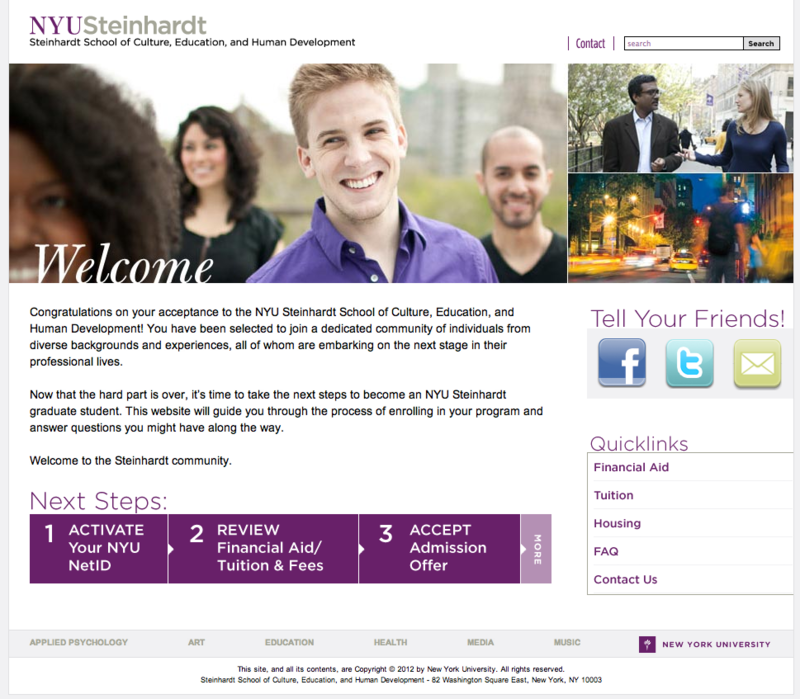 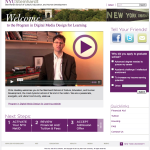 I led the strategy and management of the 2012 Yield Campaign for NYU Steinhardt. 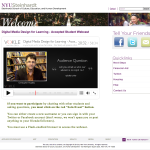 Below are samples of the communication channels used to engage students. 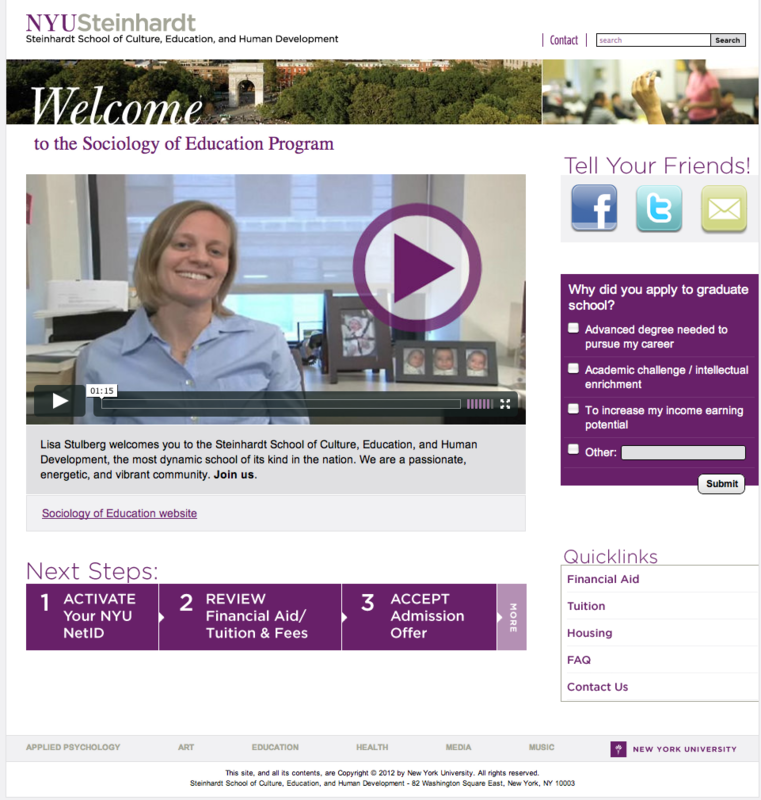 As website created specifically for accepted Graduate Students, with simple instructions, useful links, and a frictionless interface to take the next step and submit a deposit. 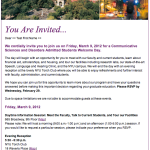 The primary method of communication with students was via email. 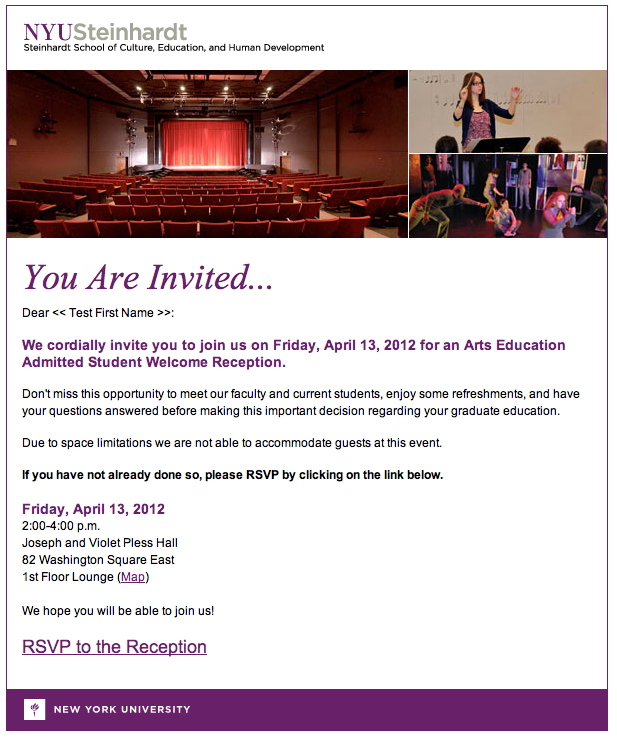 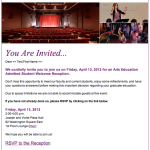 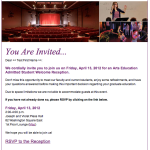 All announcements, invitations, and welcome videos were sent via email to the accepted students’ personal address. 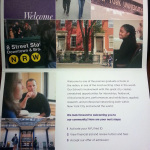 All accepted students were sent a brochure that was graphically linked to the website and email. 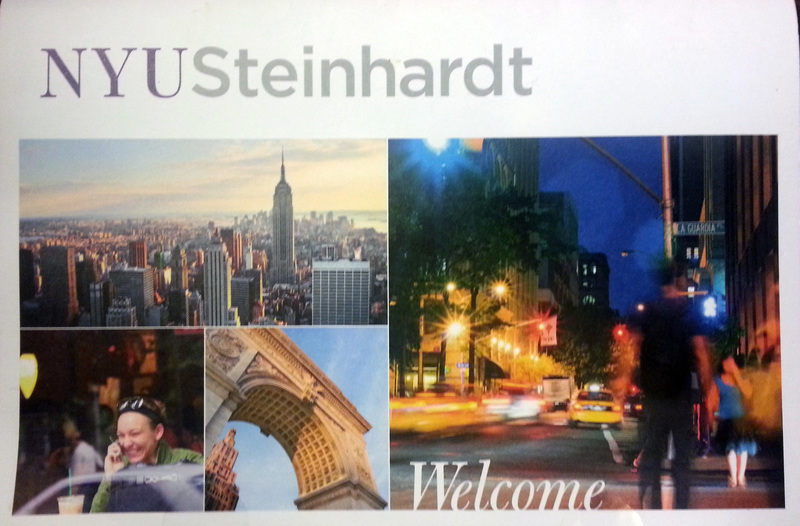 The brochure welcomed them to NYU Steinhardt, and offered useful tips about being a student and living in NYC. 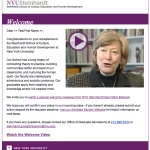 A welcome video from the Dean of NYU Steinhardt, Mary Brabeck, was sent to all accepted students within 1-3 days of their official acceptance. 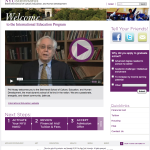 The following day, the students receive a video welcome from the director of their program. 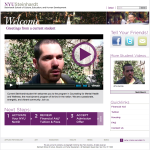 We created short videos of current students for several “priority programs.” The students were nominated by faculty members and offered a moderate stipend to serve as a Steinhardt Ambassador. 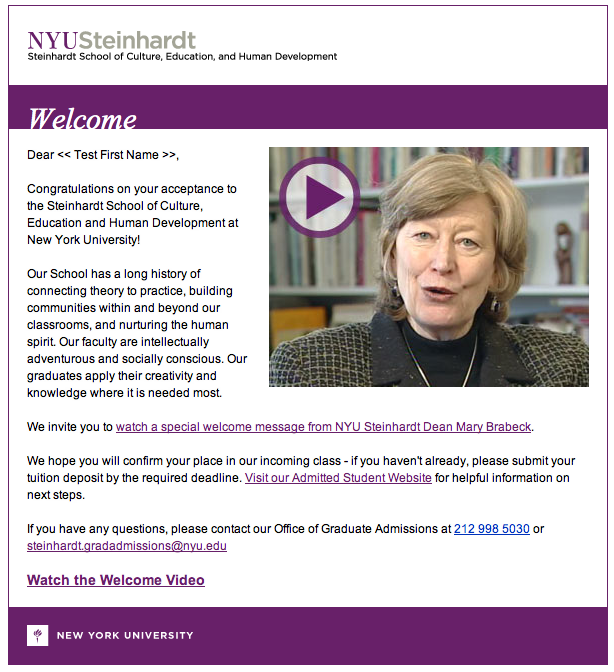 The students composed their own welcome email to the new admits (with our guidance) and offered to answer any questions via email/phone. 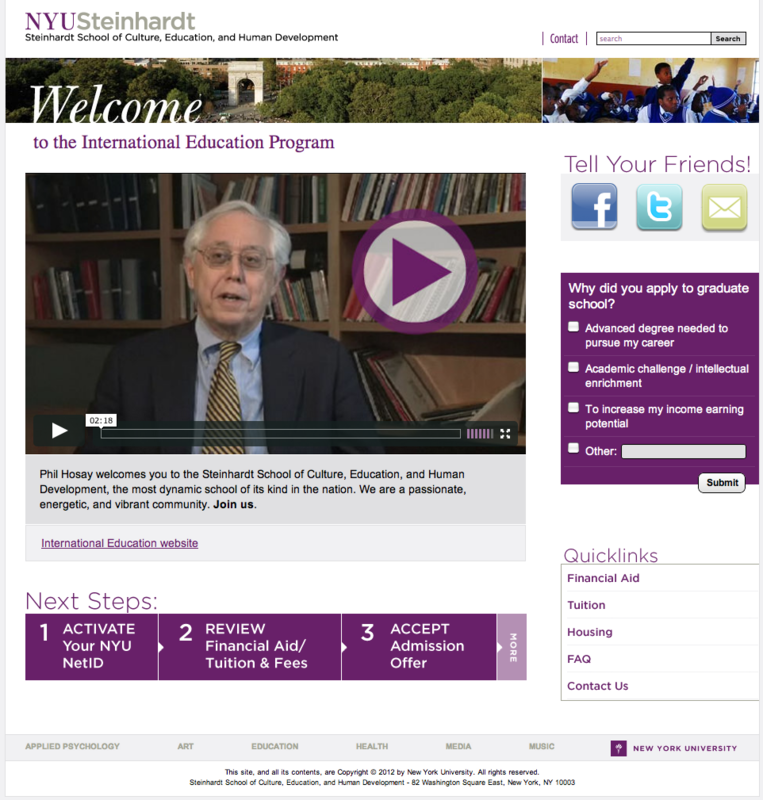 This gave all accepted students a person connection with the program. 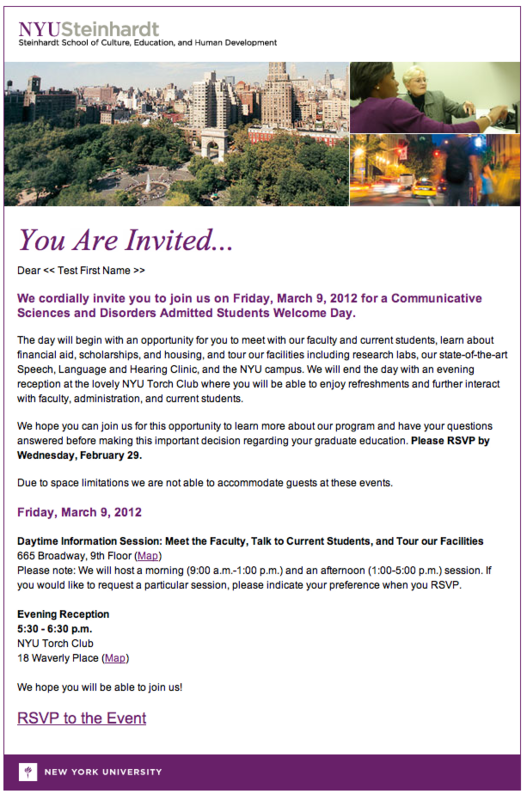 All accepted students were invited to on-campus welcome receptions, which were program-specific. 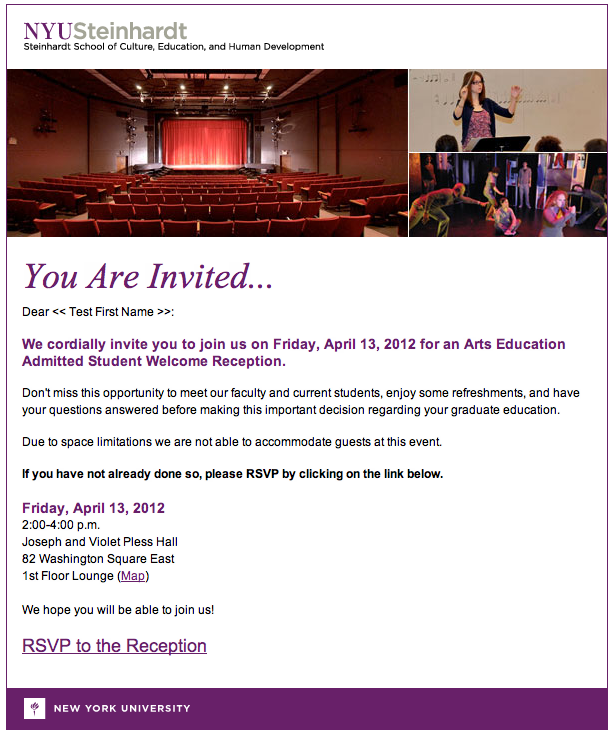 The reception included wine/hors d’oeuvres, and were attended by the students/faculty who had already appeared in welcome videos. 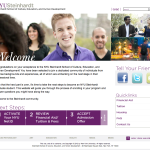 The online/in-person communication was integrated and the feeling of community was reinforced. 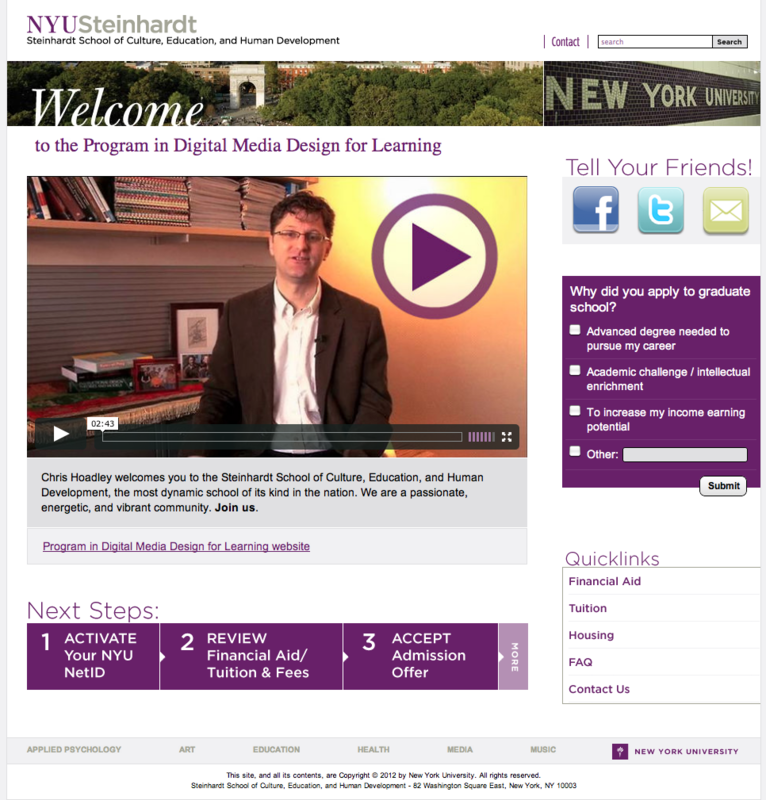 As students visited our “Accepted Student Website,” they received a browser cookie which stayed active for 30 days. 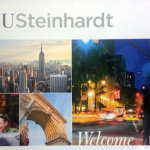 During that time, the accepted students would see advertisements on other third-party websites encouraging them to join the Steinhardt community. 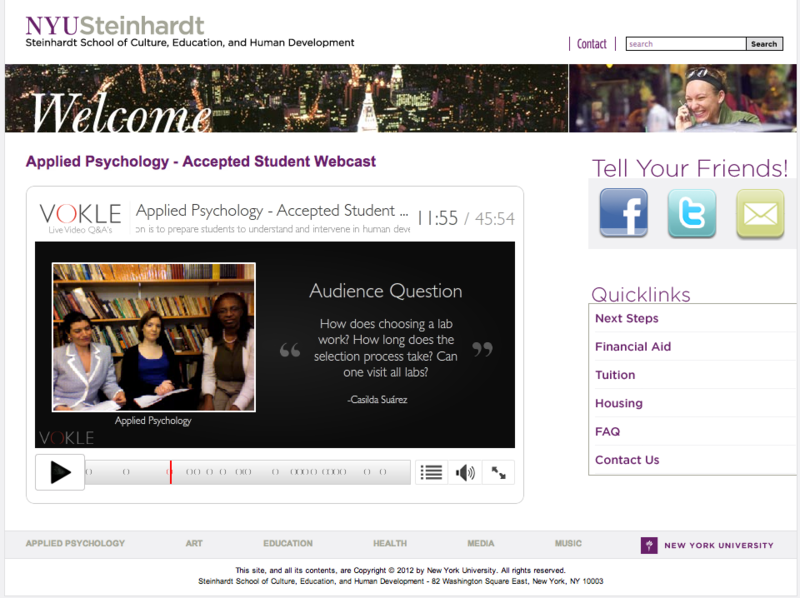 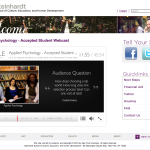 For students who could not attend an on-campus webcast, we hosted several video webcasts. 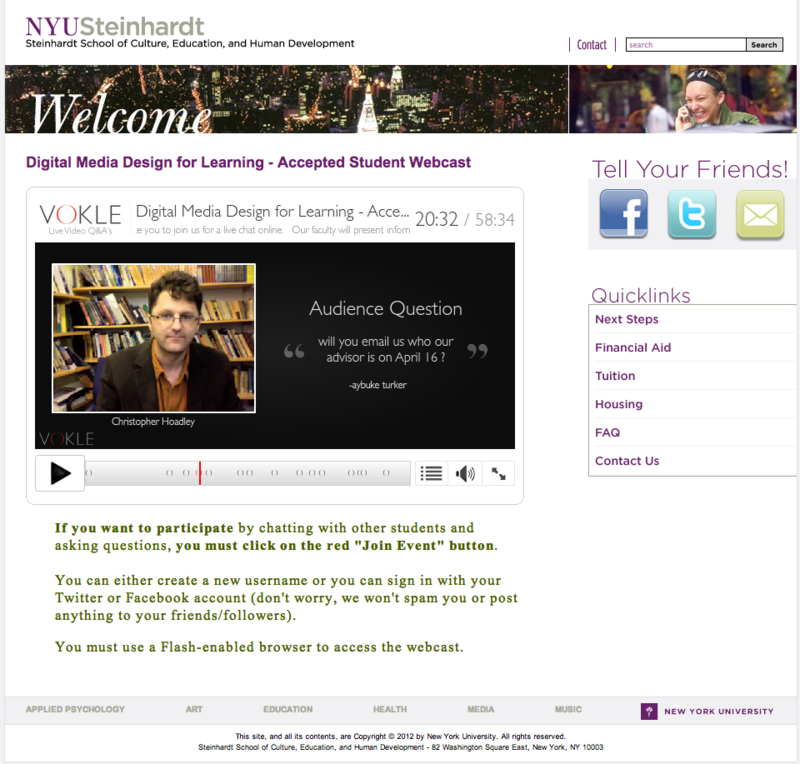 These featured current students and faculty who would talk about the program and answer questions live using the Vokle platform. 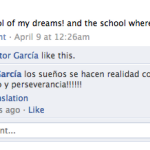 These were attended by students from all over the world including China, Italy, Spain, and Argentina. 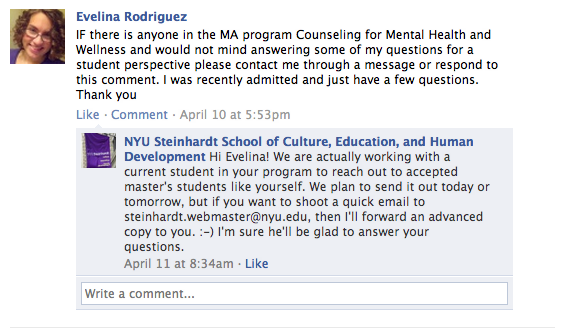 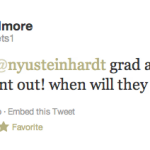 At every step of the way, students were encouraged to share/tweet their acceptance into NYU Steinhardt. 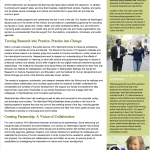 We also offered links and connection to a variety of different social channels (Department pages, twitter accounts, email newsletters). 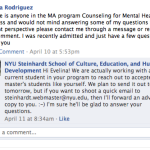 We also monitored the social-web for communication about being accepted into NYU and responded when appropriate.